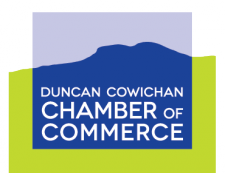 The Duncan Cowichan Chamber of Commerce is a volunteer, not-for-profit business organization, representing more than 550 members. The Chamber is funded through membership dues, fundraising, and grants from governments and agencies. The Duncan Cowichan Chamber of Commerce also operates the new Cowichan Regional Centre which opened in November 2013. The day-to-day operations of the Chamber and the Visitor Centre are carried out by three full-time staff and a pool of volunteers. A dedicated volunteer Board of Directors guide the strategic direction of the Chamber. We are also fortunate to have a committed group of committee members who continually make this chamber successful. Started as the Duncan Board of Trade in 1908, the Duncan Cowichan Chamber of Commerce has a similar mandate as it did over 100 years ago: Build a Strong Community Through Strength in Business. Our mission: Engage the business community through membership to provide advocacy, service, education, support and opportunity. This is a great question! Many people are not aware of the many things the Chamber does to promote business, community and quality of life in the Cowichan. The Chamber provides opportunities for businesses to grow and profit through: networking, training, education, marketing and sponsorship opportunities, and events. Through our affiliation with the BC Chamber of Commerce, individuals and businesses save on a variety of business services and medical and insurance benefits. Our goal is to develop a cohesive business environment in the community, educate the community about business issues and showcase Cowichans’ thriving business environment.